You look for them anxiously when the time seems right. Sometimes you’re too early, nothing. Sometimes they are there, but disconnected and lost in a crowded box, just OK.
Then they appear, perhaps first outdoors in a market, or maybe lying naked among scads of lesser, cellophane wrapped denizens of the produce section. into one of fall’s best treats, even better if harvested after the first frost. It’s even fun to carry out of the market, too long to fit into a bag, appearing like the baguette carried by a French guy in a beret. Should the idea of Brussels sprouts conjure up the taste memory of olive green mush with a funky taste and worse smell, remember that these were probably abused by having been overcooked to death. Wipe clean the slate. Fresh ones, in season, are sweet and delicious, and super easy to prepare. simplicity, and just about done, the poke of a paring knife getting just a little resistance. byproduct of another autumnal treat). They can be shredded and smothered like any other green vegetable, like spinach, or roasted. 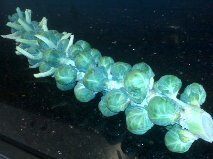 Also known as Choux de Bruxelles (cabbages of Brussels), sprouts are believed to have been cultivated in the Low Countries for hundreds of years, not becoming really widespread until the 20th century. So, don’t travel to Brussels expecting to find sprouts everywhere. That would be mussels, frites, and waffles, and that’s another whole story. You are right – they are delicious this time of year. A Greek friend of ours introduced us to cooking them in olive oil in a frying pan then dousing them with freshly squeezed lemon juice, salt and freshly ground pepper. I like to added sliced sun dried tomatoes to this. Warning: do not take this approach late in the season when the Brussels get bitter.